The TC647 is a switch mode fan speed controller for use with brushless DC motors. Temperature proportional speed control is accomplished using pulse width modulation. A thermistor (or other voltage output temperature sensor) connected to VIN furnishes the required control voltage of 1.25V to 2.65V (typical) for 0% to 100% PWM duty cycle. Minimum fan speed is set by a simple resistor divider on the VMIN input. An integrated Start-up Timer ensures reliable motor start-up at turn-on, coming out of Shutdown Mode, or following a transient fault. A logic low applied to VMIN, Pin 3, causes fan shutdown. 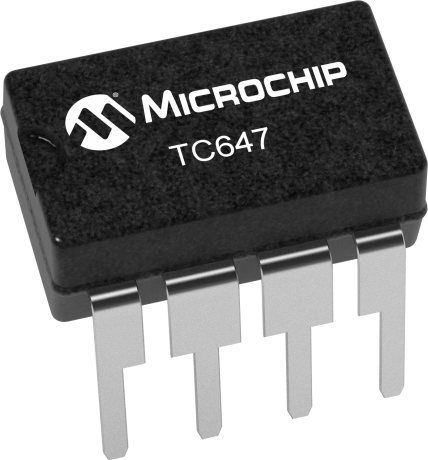 The TC647 also features Microchip Technology's proprietary FanSense™ ™ technology for increasing system reliability. In normal fan operation, a pulse train is present at SENSE, Pin 5, indicating normal operation. A Missing-pulse Detector monitors this pin during normal fan operation. A stalled, open, or unconnected fan causes the TC647 to trigger its start-up timer once. If the fault persists, the FAULT output goes low, and the device is latched in its Shutdown Mode. The TC647 is available in a standard 8-Pin PDIP, MSOP and SOIC packages. Commercial and industrial temperature ranges are available in both package options.